5 Reasons to get in the Holiday Spirit with Circle Circle dot dot! We are now into our second week of Naughty or Nice and are so thankful to all of the audiences that have shown up thus far. You have been a fantastic addition to our seasonal stew! I hope you enjoyed your experience and will encourage everyone you know to expereince it as well. When crafting an all new Christmas show (or any show) you have to think about the audience. Christmas is a time for families to get together and enjoy some cheer, but our audience has grown to love our willingness to go to the raunchy extereme. So, we decided to provide a pair of joy-filled productions to reach both sides of that coin. Nice is a family friendly show in the purest sense. It is made to entertain children and adults alike. Have family in town? Bring them downtown for some joyful fun. It is sweet, kind and very funny. 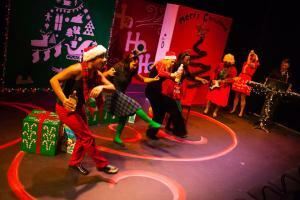 Naughty is the chance to get down with Christmas with wildest of theater lovers. It dares to get dirty, speak to your grinch-y side, and keep you roaring with laughter. When we first started discussing the project we new it might be a hard sell, as all new shows can be, but sometimes you just have to follow your artistic side and go for it. So with that in mind I wanted to give you 5 quick reasons you should see Naughty AND Nice this holiday season before it's too late. 5) Great For Groups- Get your co-workers and friends together, see Nice, grab dinner and/or drinks and then return to the theater for a rocous good time at Naughty. We promise you'll have a fantastic evening. 4) It's Different- Across the country this time of year 100's of theaters are producing the regular Christmas fare. However, We are bringing you somethign all new. These are never-before-seen stories that protray the heart of the modern Christmas. They will leave you just as spirited as any of the 10 productions of the "traditional" Christmas offerings in town. 3) The Length- Nice is 1 hour long. With it's 6:30pm start time on Thrusday/Friday and 4pm start time on Saturday/Sunday you could bring your children and grandparents and have them home by 8pm for bed. Naughty is a fast paced 80mins of crazy that will end in time for you to hit up da club after. 2) The Cast- A stunning cast of 7 preformers sing, dance and act their way through 40+ characters in two separate shows. It is a feat that anyone can appreciate and all of their performances shine. 1) The Price!- Theater tickets can be expensive, but we believe in keeping our shows accessible. So, in the spirit of giving we lowered our generally low prices so that all Christmas lovers can attend. I hope you get your tickets today and see some truly entertaining theater! We only have 5 performances of each show left. I can't wait to see you at the theater!